Cover of the Adventures Among Ants, by Dr. Mark W. Moffett. Not many scientists beg perfect strangers to eat the species they study. But that’s just what “Doctor Bugs” did when visiting tourist-magnet ruins in Cambodia. Dr. Mark W. Moffett proffered a dish of scrumptious crackers topped with herbs and, um, plump ant larvae to passersby — at times literally pleading with them to try it. It’s just one of the ways the world-famed ecologist, and Smithsonian Institution research associate, gets people to stop and notice the trillions of ants that share our world. 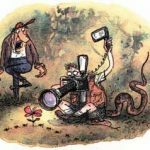 National Geographic cartoon of Moffet squatting on a pit viper. More often, Moffett’s stories are about the ants themselves — their diverse ways of sensing the world, interacting, and divvying up labor to achieve survival goals efficiently. 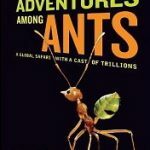 Moffett’s high-energy slide show was centered around promoting his new book, Adventures Among Ants: A Global Safari With a Cast of Trillions, published by the University of California Press. “Ants differ from us in that the individual doesn’t matter, it’s all about what’s good for the group,” Moffett said. But they’re colonies are a lot like our cities, he went on to explain, drawing analogies between small cities/small ant colonies and large cities/large ant colonies. In smaller colonies, where there is less specialization of labor, each ant has to be a jack-of-all-trades and perform a variety of tasks.”They have their toolboxes built-in to their faces,” Moffett said, flashing a picture of a type of trap-jaw ant with extra long pitch-fork tipped jaws. It uses the long levers to pick up struggling prey and carry it safely back to the nest. But a much smaller, second pair of jaws tucked closer to its mouth allows it to eat. Larger colonies, like our larger cities, tend to have more job specialization, Moffett said. Scientists can often tell what role they play by their size. Sometimes the largest ants of the same species outweigh the smallest ones by 500 times. The goliath ants are often used to deliver the death blow (a sting, or a bite) in battles with other ants or interlopers, and even act as “school buses,” allowing smaller ants in their colony to hitch rides. “Basically, it’s more energy efficient for the colony if the smaller ants ride on the bigger ants,” Moffett explained. He also talked about various ways that ants work together, like the free-diving ants in Borneo that live in pitcher plants. They fetch crickets out of the water pooling in a pitcher’s basin, then haul it to the lip of the pitcher where they stash it and have a feast. The crickets are often too large for the pitcher plants to digest, he explained, so the ants are doing the plant a favor by saving it from experiencing an overdose of acid as the cricket decays. “They’re basically antacids for the plant,” Moffett joked.”But they also must have the strongest toes in the world to carry these large crickets up the slope of the pitcher plant, which is made so that insects will fall into its trap.” Ants also form chains to create living bridges that they use to cross from one tree to another high amid the canopies of rain forest trees, hundreds of feet from the forest floor. And some ants will sacrifice themselves to fill “pot holes” along highways the colony uses to move things to and from their nest. Then there are the leaf cutter ants, which divvy up leaf harvesting and fungus cultivating duties like nobody’s business (see photo at right). Moffett’s photographs have been widely published and he often contributes work to National Geographic magazine. He searches for images that tell a story within their frames, he said, like the one he took of a battle between two ant species that shows a Goliath ant fending off attacks from smaller ants, with the carnage of warfare in the background: headless ants frozen mid-stride, and ants with their torso’s chopped in two and legs torn asunder. He encouraged the kids in the audience to “not lose that weird point of view you have when young,” because it can be valuable to being a scientist. He credits his own path to biology and entomology with reading too many Jane Goodall adventure books when younger, and climbing too many trees. Moffett’s talk deftly distilled insights about ant ecology and social interactions into anecdotes that enthralled kids and adults like me who are in touch with their inner kids. If you missed his talk, you did miss out — but don’t sweat it, you can always order the book. Learn more about laboratory equipment and their uses at scienceinthetriangle. Check out our article on UV Vis spectrophotometer prices to get an idea on how this essential laboratory equipment costs.